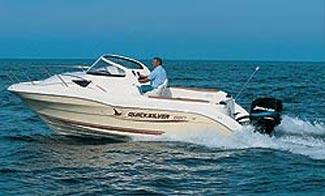 Boat Description The 620 Cruiser and the 540 Cruiser are sporty craft with the same beige and burgundy livery but with Mercury or Mariner outboard power. They have all of the extras  as standard  of the 650, too, including bench seating, ski locker, berth cushions, swim ladder, opening deck hatch, bilge pump, cockpit upholstery, co-pilot seating and a sun deck. Both may be equipped with ski poles.